Read about a hapless deli owner who takes Santa's place on Christmas Eve. Learn about the history and the observance of Kwanzaa. 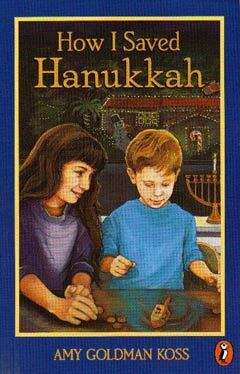 Join a young girl as she discovers for herself what Hanukkah is all about. Follow the exploits of two naughty trolls who try to have Christmas -- by stealing it. This week's books explore the true meanings behind the holidays. December is the last month of the year and quite probably the busiest, with a variety of different holidays that people celebrate. The following new books will help you make a comparative study of Christmas, Hanukkah, and Kwanzaa; provide lessons on the value of kindness, friendship, and other virtues; or just give you and your class a different take on the holidays. For a hilarious send-up on 'Twas The Night Before Christmas, by Clement Clarke Moore, check out How Murray Saved Christmas (Price Stern Sloan), written by Mike Reiss and illustrated by David Catrow. When Santa is incapacitated on Christmas Eve, his assistant, Edison Elf, frantically recruits deli owner Murray Kleiner to take Santa's place. Murray is at first reluctant and demands to know why he should undertake such a monumental task, but Edison wins him over by simply stating, "Because it's Christmas." "The cheapest of cheapskates will spend all his money. And people make fruitcakes from concrete and honey. Christmas works magic, and Edison knew it. "'There's Dumbo and Jumbo and Mason and Dixon, Cosmo and Kramer and Richard M. Nixon.'" With Edison's help, Murray not only finishes the job in record time but actually carries the Christmas spirit one step further when he decides to deliver toys to the naughty children as well as the nice! 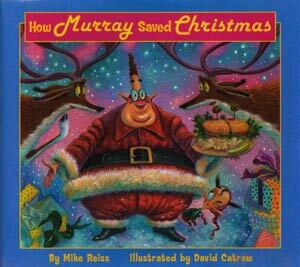 How Murray Saved Christmas is the first book for author Mike Reiss, who previously served as the executive producer of the television show The Simpsons during its first seven years. The pictures, by children's book illustrator and syndicated columnist David Catrow, practically explode with detail and color. In particular, the characters, with their disproportionately large heads, miniscule legs, and exaggerated facial features, reinforce the cartoon-like quality of the book and remind the reader that it is all in good, clean fun. The book's humor, although often irreverent, is never condescending or mean-spirited. Although the publisher's information suggests that How Murray Saved Christmas is appropriate for children ages four through eight, it is unlikely that youngsters under age nine or ten will appreciate the zaniness. This book would be particularly appropriate when paired with a reading of "'Twas the Night Before Christmas" as an example of the use of parody. 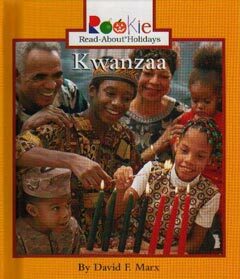 Kwanzaa (Children's Press), written by David F. Marx, is part of the Rookie Read-About Holidays series geared toward children ages four through eight. This 32-page book introduces youngsters to Kwanzaa, an African American holiday. The book covers many facets of the holiday, from its inception in 1966 to various details of its observance. For example, children will learn that Kwanzaa begins on December 26 and lasts for seven days, that it honors African culture, and that it celebrates seven important principles. The book presents words that may be new -- such as kinara, the unique candleholder for Kwanzaa, and kikombe, the large unity cup shared by members of a family -- with simple definitions and pronunciations. With one or two sentences per page in large print and large, full-color photographs, Kwanzaa is easy for first or second graders to read and is visually interesting. The photographs are colorful and mainly depict families and children engaged in the preparation for or celebration of Kwanzaa.
" ... when the sub put a piece of blue paper and a piece of white paper on my desk, my giggles quit. I glanced down at the Hanukkah colors and watched the sub hand out red and green paper to everyone else. My cheeks got hot. "Mrs. Guyer must have left a note for the sub saying there was one Jew in the class and I was it. A few days ago, before she abandoned us to this sub, Mrs. Guyer had me make a blue-and-white candle when the rest of the class made red-and-green ones. She talked about how everyone is different and that's what makes the world interesting. But everyone isn't different -- just ME." Marla Feinstein is the fourth-grade narrator in How I Saved Hanukkah (Puffin Books), written by Amy Goldman Koss and illustrated by Diane deGroat. The only Jewish child in her class, Marla has come to dread December. Her parents not only do not have a Christmas tree but also are mainly indifferent to their own Jewish holidays, including Hanukkah. Other kids open presents and sing carols, but Marla can only hope for a few lackluster gifts -- unwrapped -- and at least a few nights of lighting the menorah -- the special candleholder used during Hanukkah -- before her family loses interest and forgets to light the candles during the last days of Hanukkah. As Marla tells her mother, "If we can't have Christmas because we are so Jewish, then let's at least be Jewish!" This year promises to be worse than usual, with Marla's father out of town on business. However, little by little, Marla takes it upon herself to learn what she can about Hanukkah. She discovers how to properly play dreidel -- a game in which players spin a top-like toy. She teaches her younger brother and her mother, who find that they enjoy spending time as a family playing a simple game together. Marla's mother -- who describes herself as "cooking-impaired" -- is even inspired to try her hand at cooking latkes -- potato pancakes -- for the first time. By the eighth night, Marla and her family are enjoying the holiday so much that they invite everyone they know -- Jews and non-Jews -- to a big Hanukkah party. Koss skillfully makes Marla's voice sound authentic. The fourth grader has concerns that will be familiar to many readers. Her best friend, Lucy, has two cool older sisters, and Marla has only a somewhat annoying younger brother. Lucy's house is decorated in warm colors with old furniture; all the rooms in Marla's home are the same antiseptic white. Lucy, like the rest of her family, has beautiful short curly blond hair in contrast to Marla's long dark hair. As the story progresses, Marla discovers that many of the things that she disdains in her own life are the very things that Lucy wants: Lucy is tired of being the youngest and thinks it's neat that Marla's little brother looks up to Marla so. She loves Marla's long dark hair. She would gladly trade in her big sisters to have her own room like Marla, and she even likes the modern, white decor! How I Saved Hanukkah works on more than one level. It provides a great introduction to Hanukkah -- its history, observance, and traditions. And the realistic friendship between Marla and Lucy will feel familiar to children who know what is like to be deliriously happy with their best friends, then jealous, then angry, and finally best friends again -- all in less than a day! Where How I Saved Hanukkah works best, however, is in exploring the feeling that many "different" children experience all too often: that being different is not, as adults always say, about being "special"; it's about standing out. It can be uncomfortable for a child, who may, like Marla, also feel vaguely guilty about that discomfort. Christmas Trolls (Puffin Books), written and illustrated by Jan Brett, continues the story of a young girl named Treva, who first appeared in Brett's earlier book The Trouble With Trolls. Treva and her family are preparing for Christmas, when their holiday decorations, presents, even food begin to disappear. When she spies a hedgehog running off with the Christmas pudding, Treva follows him, and discovers two mischievous trolls who are hoarding all the stolen goods in the hope that these holiday trappings will bring them Christmas. "I looked at them and had to smile. Their shirttails were hanging out. Their pants were torn and patched. Their cheeks were bright red and their hair was standing straight up from all the pulling and tugging at each other." "'Christmas!' they wailed. 'We want Christmas!'" 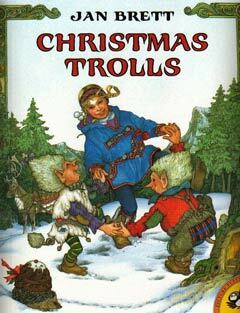 So Treva sets about teaching the trolls -- whom she discovers are named Mig and Tig -- how to have Christmas. She helps them clean their messy home and decorate it for Christmas. She shows them how to play together and demonstrates the spirit of giving by presenting them with her own favorite toy horse. Her faith in Mig and Tig is rewarded on Christmas morning when she finds a surprise present that could only have been left by her two new friends. The story is sweet and told in a straightforward way, but the real charm of Christmas Trolls lies in the artwork. Brett, an award-winning author and illustrator, derived the look of Christmas Trolls from a trip to Norway. Brett's breathtaking drawings of snow-covered hills densely punctuated with the deep green of the evergreen trees were inspired by a trip to Norway. The rosy-cheeked children -- blond Treva in her blue outfits and her darker-haired little brother -- are drawn realistically and stand out against backgrounds. The trolls resemble funny-looking children, with their big heads, oversized ears, and hair sticking straight up from their heads. For coloring pages, activities, and other ideas to enhance the reading of Christmas Trolls, take a look at Welcome to Jan Brett's Home Page. Ten Holiday Web Sites You Won't Want to Miss! Ho! Ho! Ho-liday Art Projects Even Santa Would Love!